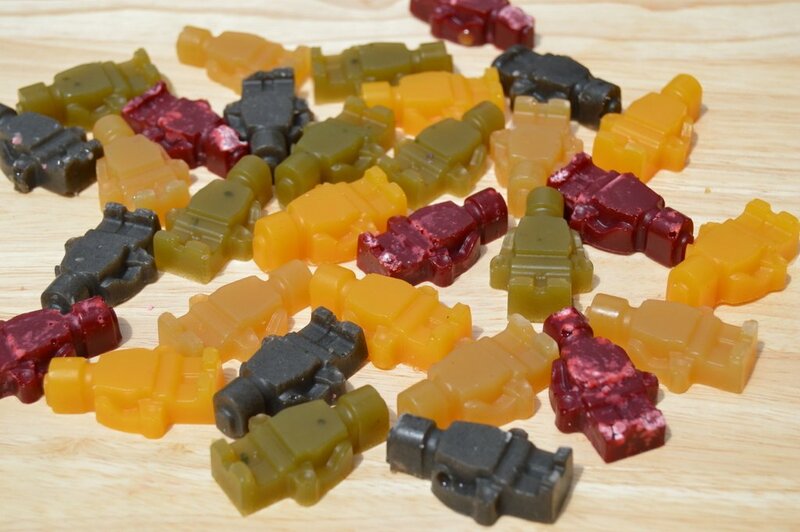 These fruit juice jelly sweets are made of just 3 ingredients; fruit juice, the seaweed agar agar and a sweetener. Vegan and healthy jelly sweets are quick and easy to make. Agar agar is a really fun ingredient to play with as it sets liquids and can be used to make many things like cheeses and sweets. 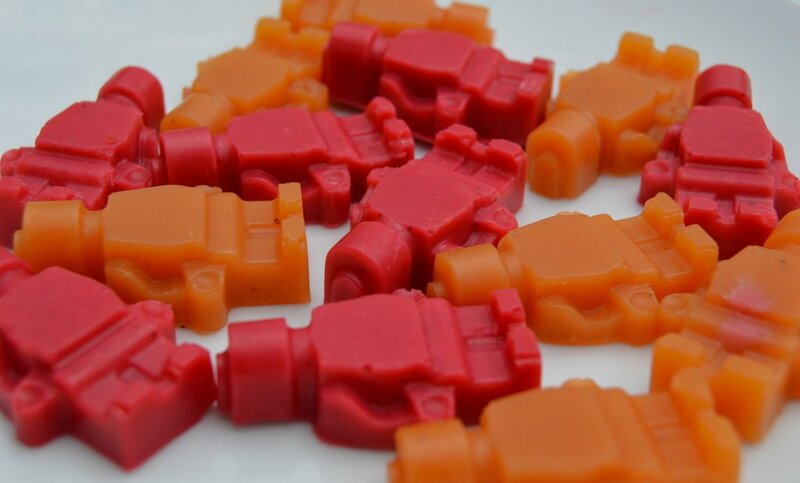 For the photos here a Lego man mould was used for these vegan jelly candies but if you only have flexible ice cube trays these will work – it just wont be quite as fun. I’ve experimented with gelatin before, but the smell is very unpleasant. Even if you’re not vegetarian agar agar is a much better ingredient to work with. You can use any sweetener you like in these vegan sweets, I’ve used maple syrup, date syrup and xylitol and they all work great. It will still set without any sweetener but will be less like a sweet. The juice is simmered for a few minutes in order for the agar agar to thicken and to evaporate some of the water to make the fruit flavour more intense. Agar agar comes in several different forms (powder, flakes and bars). However for these I use the powder for these vegan jelly sweets and it’s the most potent. If you can only get the others you may need to try with different amounts. You can test if your mixture will set by dropping a small amount on glass where if it has enough agar agar it should set in a few seconds. The black sweets are kiwi flavour, but I didn’t wash out the pan between the dark plums. This turned out for the best and added more colour to the end sweets. I would recommend when making these healthy jelly sweets starting with the light colours that won’t discolour the rest so you won’t need to wash out your pan between flavours. However you may want to mix one batch to get a dark colour but not all, or you might have just have black sweets! For the apple fruit sweets I used carton apple juice that is brown so added half a teaspoon of barley grass to make them green. For the first one I used cornstarch as I was expecting them to be slightly sticky, but they aren’t sticky at all so no cornstarch is needed. I tend to juice fresh fruit to make these simply because it allows for several different colours / flavours without buying several different litres of juice. Shop bought juice works just as well and makes these really quick to make. I often just use one carton of juice to quickly make a single flavour batch. Place the mould in the freezer. Stir in the agar agar and sweetener until dissolved. Bring to the boil. Simmer for 5 mins stirring constantly. Take off the heat and let cool for 2 mins. Pour into the moulds and place in the freezer. Don’t worry if the mixture spills over the mould, this excess can just be pulled off when its out of the mould. Take out of the freezer after 5-10 mins when solid and pop out of the moulds. As they are fresh they wont last like normal jelly sweets. Store in the fridge and enjoy a few days after making, mine often don’t last an hour. If you like this recipe check out our Rosé Wine Jelly Sweets Recipe! Check out my other recipes for healthy jelly sweets and candies including healthy candy corn, gemstone coconut water and CBD turmeric sweets. If you use xylitol to make these, make sure to keep them away from dogs. Xylitol is deadly poison to dogs. Even a very small amount can be fatal. how long would these gummies keep for? How can apple juice be green? What cloth di you use to squeeze out the juice? Could one use honey or coconut blossom sugar instead of Xylitol? When we have to mix with juice?